Welcome, Ministry fans! Thanks for visiting! I have a pair of lovely little giveaways for you, but before I share those details, let me tell you a little story about what I love about steampunk. I didn’t intend to become a writer of steampunk stories. I really didn’t. I knew the term, sure, but it was just another literary sub-genre to me … until a gentleman named Mister Lapin wandered along and changed everything. One morning I was driving to work, listening to the Dr. Horrible soundtrack, and as the mad, bombastic closing credits music played I was suddenly struck by an idea: What if I wrote a story about a man who turns himself into a half-man, half-rabbit? And what if he used alchemy to solve mysteries? It was so crazy I just had to do it, and when I sat down later that evening, I found the voice naturally became an excitable British man straight out of the Victorian era. The Impossible Mister Lapin, my novel of weird science and occult investigations in a Britain that never was, had begun. It quickly took on a life of its own, growing from a short story to a serial novella to my first ever full-fledged novel, adding gadgets and alchemy and evil spirits as it went, often with me feeling as though I was trailing slightly behind, trying frantically to keep up. What was even more amazing, though, was the scene that surrounded this new world I’d chanced into. My wife, the costumer, had started attending Dorian’s Parlor, a lovely steampunk gathering in Philadelphia, and as the story of Mister Lapin took on life she brought me along with her. I was stunned and enchanted by the creativity and vibrancy of the community – there were people faithfully recreating exquisite Victorian and Edwardian dress down to the smallest detail, while others blasted off into the far realms of steam-powered fantasy as airship pirates and eccentric inventors, and everything inbetween. There was music, art, fashion, gadgetry, literature (always a relief for a writer looking to sell a tale), academic discussion … there was a community. And even though some of them liked to quarrel about what did or didn’t suit the scene, or even how to define the term “steampunk” itself, in the end the movement always seemed to celebrate a diversity of inspiration that was positively breathtaking. In many ways, meeting the steampunk community – at Dorian’s, at New York Comic Con, at Steampunk World’s Faire and many other places besides – reminded me of Christian’s first experience with the Moulin Rouge in the film of the same name – a whirl of sounds and sights, faces and delights. And that’s without any absinthe to help the experience along! I look around at all the passion and energy and innovation being poured into the fashion and music and writing and crafting, the humor and style and class that inform and support this scene, and I don’t hear metal. II – Rally Behind the Ministry! “Galileo Games and Imagine That! Studios have teamed up to bring you an ambitious steampunk project! 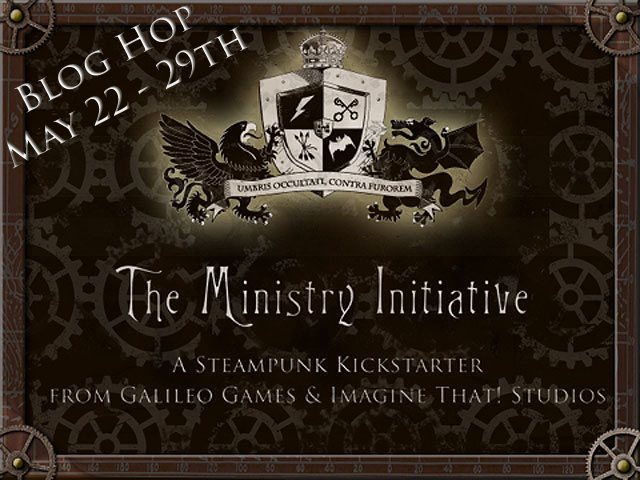 The Ministry Initiative is a two-part creative endeavor that will not only premiere new fiction from the steampunk world of the Ministry but also present a brand new role playing game from the makers of Bulldogs! and the ENnie Award winning game Shelter in Place. Thrill to the tales in Ministry Protocol anthology, or join in as an Agent in The Ministry Initiative RPG. III – Last But Not Least: How to Win Free Stuff! THE “FIENDISH MENAGERIE FILES” CONTEST! I want you to create the most devious, most devilish steampunk villain you can imagine, and tell me about it! Name: Your villain’s name. It can be as simple or elaborate as you like. Don’t forget titles – they didn’t spend all those years in Evil Medical School to be called mister, after all! Signature Villainy: What is your villain’s “signature” knavery? Killer gorillas? Freeze rays? Radioactive dinosaurs? Fell sorcery? Knives in the dark? A poisoned kiss? Unexpected cats? Most Infamous Crime: Give the title or description of their most notorious bit of malfeasance: “The Terrible Affair of the Lemon”, “The Archduke’s Sinister Disappearance”. “The Time That Gravity was Most Unceremoniously Stolen”, you name it. You don’t need to elaborate too much – in fact, it’s usually better if you leave it to our imaginations a bit. Signature Villainy: Poisonous alchemical fog! * Post your entry here at this blog, as a response to this very post. * You may enter more than once, but please, no more than once per day. * The contest is open from the time this post goes live on May 22nd to 6 PM EST on May 29th. 3) Check Back for Prizes! At the end of the contest, a winner will be decided by an esteemed panel of judges (read: as many Ministry writers as I can collect). This winner will receive a free electronic copy of my story from the Ministry Initiative anthology, currently titled “New London Calling.” Information will be collected and arrangements will be made to deliver this story in electronic format as soon as the Ministry’s esteemed editorial staff deem it ready for public release, which is likely to be a little ahead of its release to the general public. Tease your friends with knowledge of the exploits that only you are privy to as they gnash their teeth in envy! In addition, the winner and one runner-up will also receive electronic copies of Runner, my post-zombie-apocalypse, action-adventure novel. Because after some dashing steampunk exploits, nothing cleanses the palate for another course like a serving of gritty survival horror. And, having just referred to zombies as the literary equivalent of sorbet, I’m going to stop talking now. OK, so I’m no quite finished. I’d encourage you to check back as the contest goes forward, because you never know what other wrinkles and new developments might pop up. Don’t forget to head on over to the Kickstarter to donate to this very awesome game/anthology combo, but while you’re here, steampunk fans should really take a moment to drop in and make the acquaintance of one Mister Lapin. If that amuses you, I also like to write about LARP, writing theory. geek culture, and most anything else that comes to mind, really. It’s been a pleasure having you here – thanks for stopping by, and I hope to see some of your villains soon! It’s a strange world out there, agents.